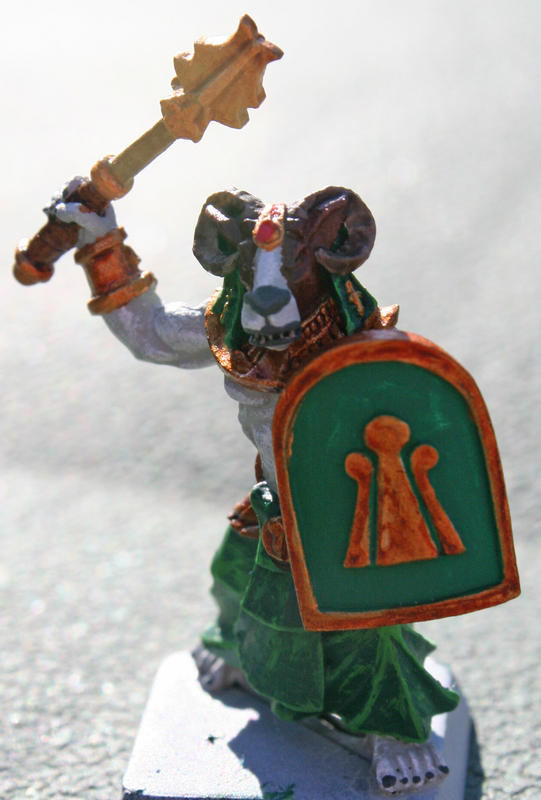 Today it is time to show the Khemru I painted for Wargods of Ægyptus recently. 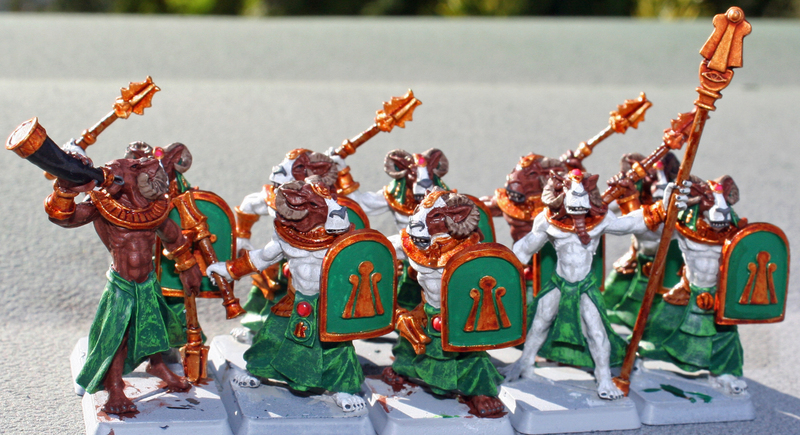 Now you will know the unit of warriors from the previous WIP post, but now their bases are done, too. After I applied the varnish, the gems got a brush on coat of high gloss varnish to make then stand out. Unfortunately they do not do so on these photos. 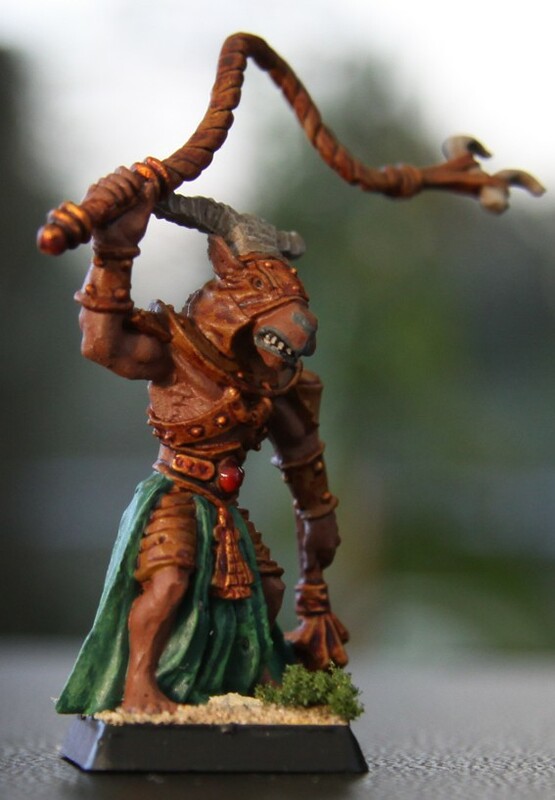 I also finished the Beastmaster. As the name suggests, he commands animals and leads them into battle. I chose an elephant for him. 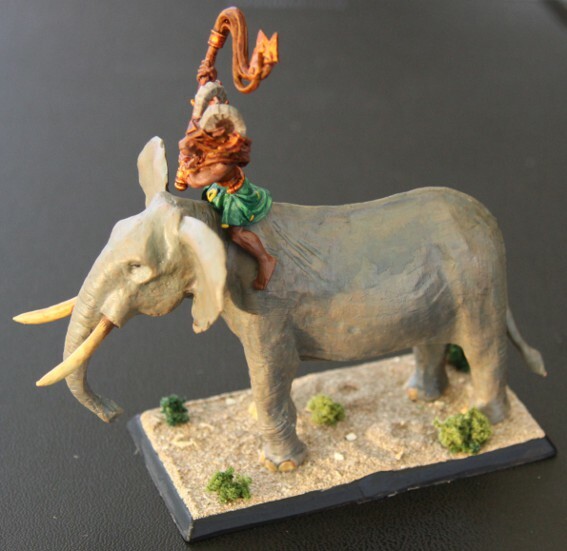 And since he has the option to ride that elephant into battle… well I think you can see where I am going with this. I almost forgot that I might need another mini for the tournament. 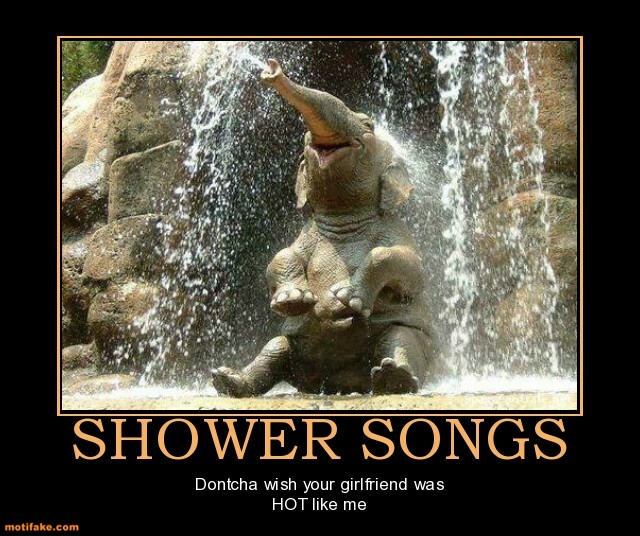 As much as I hate the fact that this might happen, the elephant could get killed. 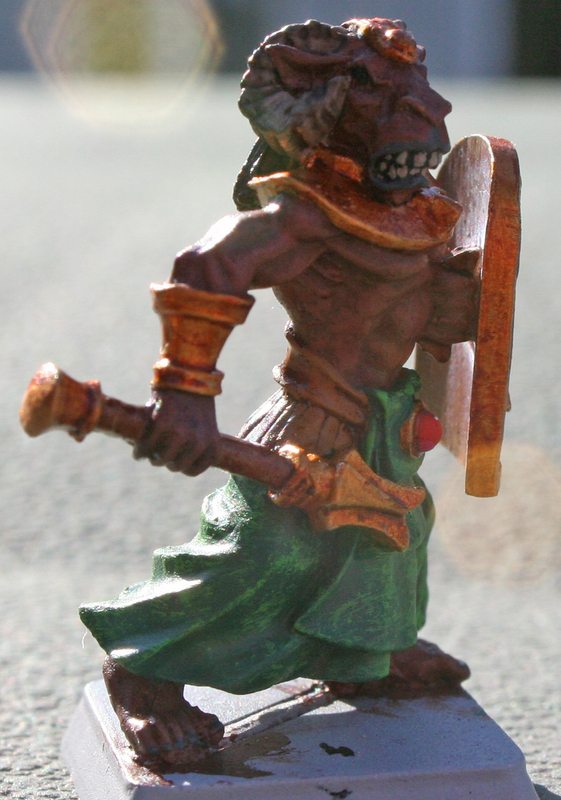 In that case the Beastmaster would have to fight on, on his own, so I needed a dismounted version of him, too. I hope these will do me proud this coming Saturday at the tournament in Canterbury. On a related note. We will be spending a week hiking in Wales afterwards. Since we do not expect to go all the way there after the tournament, we decided to spend the night in Nottingham or more precisely in Derby since we could get a better hotel for less there. Now the funny thing is, I know that there is a show in Derby on Saturday and Sunday. Must be a first me… being in a town when they have a big wargaming show and not going there… live can be funny at times! 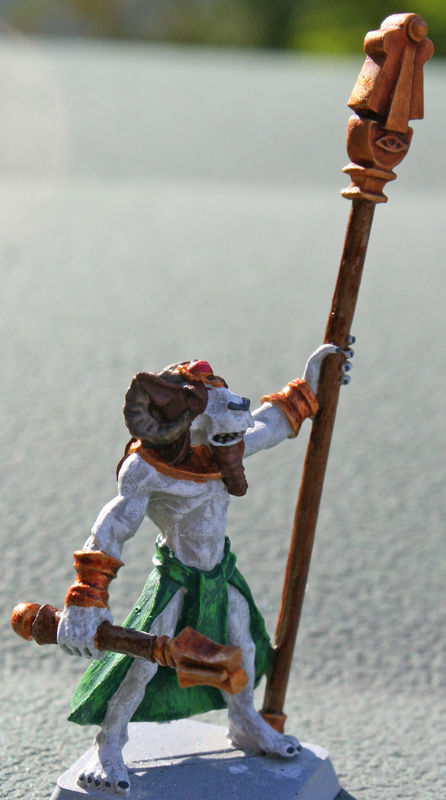 OK, I know this is quite a leap for a blog that is mostly dedicated to historical wargaming, but I still play one “fantasy” game and that is Wargods of Ægyptus. The game is based on Egyptian (and with two expansions on Greek and Nordic) mythology. It is set in the antediluvian age (the times of the old testament). Here the children of the gods wage war on one another. Now due to a lack of players here in Germany, I hardly get to play. But once per year there is the pan-european championship in Canterbury in the UK. This is where I usually get most of my games in. Now the first year I finished somewhere in the lower mid-field. Second year I finished in the upper mid-field and then in 2009 (the third year) I became the champion. Last year I was not able to make it and defend the title, due to a contract for work that prevented me from going. Now this year, nothing is going to prevent me and we are even following this with a one week holiday in the Welsh National Parks. 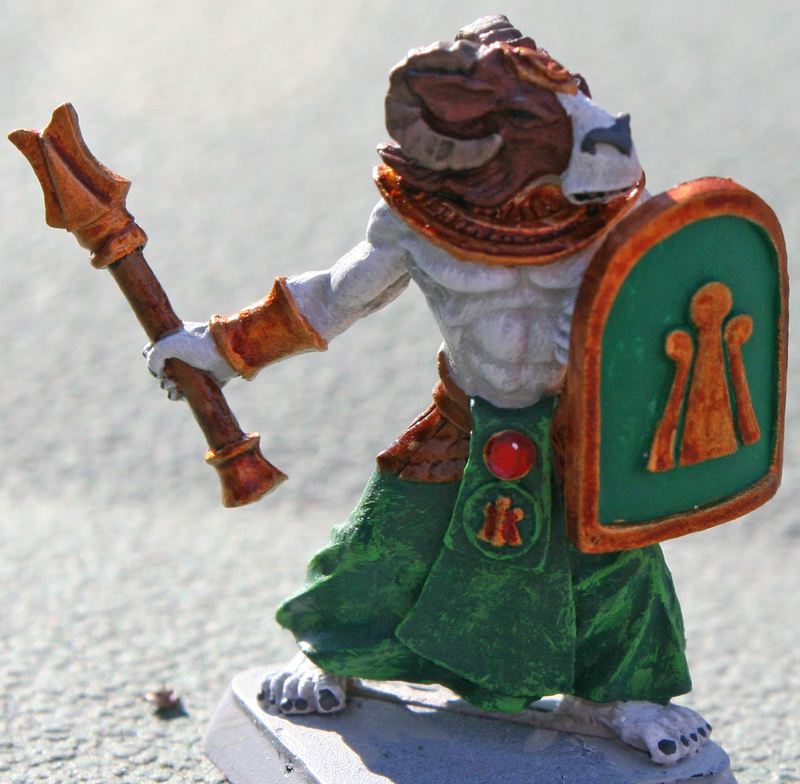 Since I did not want to start with the same warband I did last time, I needed to paint something new. One “race” I always wanted to include were the Khemru. Now these are the children of the Khnum, the Ram-headed creator god and are modeled in his shape. 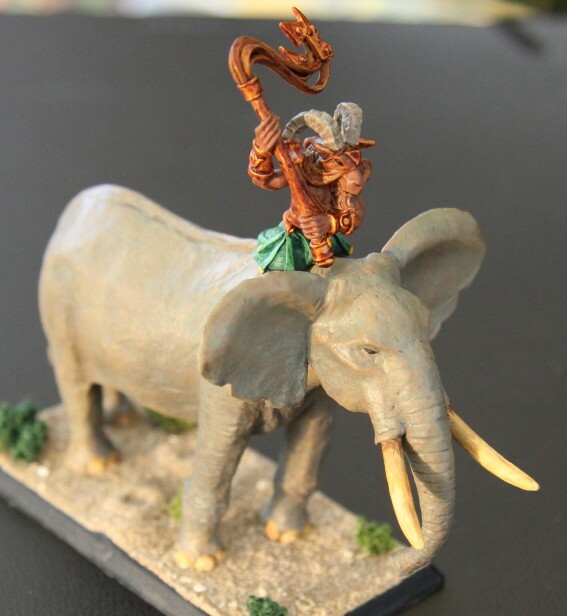 They are by far not the best warriors you can field, but I always felt that they looked nice, plus they allow you to field elephants. And I wanted an elephant for my force. 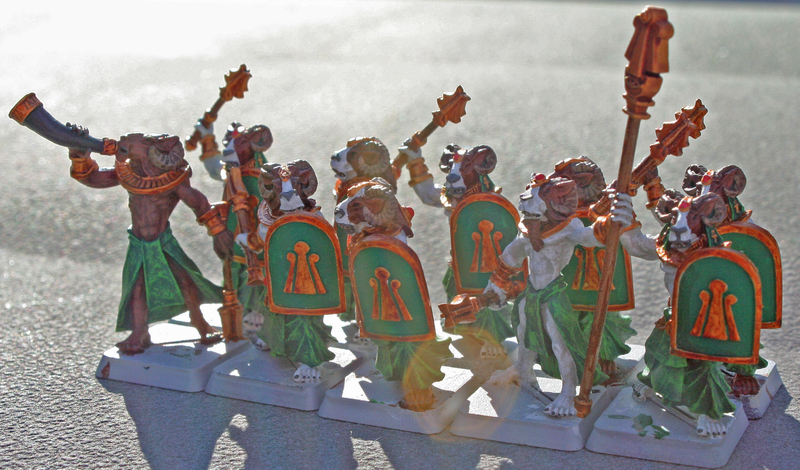 The paintjob itself is a quick one, so these 5 minis were painted in a couple of hours last weekend and with a little help by my better half. They still need to be varnished (too much rain for the last couple of days and too much humidity today), the bases need to be done and the gems require a coat of high gloss varnish. otherwise… this is it. So now I will need to finish the elephant. He still needs a quite a bit of filling. I hope to get that done this weekend and paint him next weekend. Since the tournament is October 1st there is not much time left, but it should all work out!